BEIRUT - More than a dozen Syrian rebel groups on Monday accused the country's main Kurdish militia of deliberately displacing thousands of Arabs and Turkmens as it pushes deeper into Islamic State of Iraq and Syria (ISIS) strongholds in northern Syria, amid reports the Kurdish fighters were now inside the strategic border town of Tal Abyad. 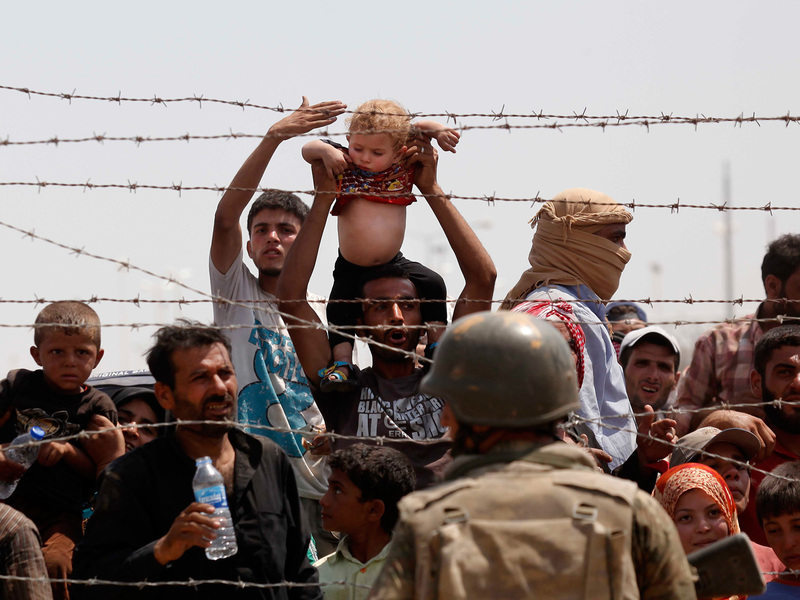 Thousands of people poured into a Turkish-Syrian border crossing, fleeing intense fighting in the area. The main Kurdish fighting force known as the YPG has pushed to dislodge ISIS from Tal Abyad, aiming to sever a key supply line for the extremists' nearby de facto capital of Raqqa. YPG spokesman Redur Khalil said late Monday that the Kurds have seized large parts of the strategic border town of Tal Abyad. Khalil said the YPG has entered Tal Abyad from the east and was advancing toward the west amid fierce clashes with pockets of ISIS resistance. He told The Associated Press in a telephone interview that he expects Tal Abyad to fall "within the next few hours." He claimed that ISIS fighters holed up in the town have fled toward Turkey. "Our advance is slow because there is a large concentration of Daesh forces inside the town and because of the large numbers of mines and booby traps they planted on the road," he said, using an alternative acronym for ISIS. The Kurdish advance, under the cover of intense U.S.-led coalition airstrikes, has caused the displacement of more than 16,000 people who fled to Turkey in the past two weeks. On Monday, up to 3,000 more refugees arrived at the Akcakale border crossing, according to Turkish state-run TRT television. An Associated Press photographer saw large numbers of people at the border and thick smoke billowing as U.S.-led coalition aircraft targeted ISIS militants in Tal Abyad. A group of 15 Syrian rebel factions accused the YPG of deliberately displacing Arabs and Turkmens from Tal Abyad and the western countryside of the predominantly Kurdish Hassakeh province. In a statement, they accused the YPG of committing "ethnic cleansing" - a charge strongly denied by the Kurds. The accusation, which was not backed by evidence of ethnic or sectarian killings, threatened to escalate tensions between ethnic Arabs and Kurds as the Kurdish fighters conquer more territory in northern Syria. With most of Syria now controlled by either Islamic militants or forces loyal to President Bashar Assad, the U.S. has found a reliable partner in the country's strongest Kurdish militia, the YPG. They are moderate, mostly secular fighters, driven by revolutionary fervor and the desire for self-rule. Since the beginning of the year, they have wrested back more than 500 mostly Kurdish and Christian towns in northeastern Syria, as well as strategic mountains seized earlier by ISIS. They have recently pushed into Raqqa province, an ISIS stronghold where Tal Abyad is located. "YPG forces ... have implemented a new sectarian and ethnic cleansing campaign against Sunni Arabs and Turkmen under the cover of coalition airstrikes which have contributed bombardment, terrorizing civilians and forcing them to flee their villages," the statement issued by rebel and militant groups said. The 15 rebel groups, including the powerful ultraconservative Ahrar al-Sham and Jaish al-Islam, said the alleged ethnic cleansing is concentrated in the northeastern predominantly Kurdish province of Hassakeh and in Tal Abyad. It charged that the alleged ethnic cleaning was part of a plan by the Kurdish Democratic Party (PYD) to partition Syria. The YPG, or People's Protection Units, is the armed wing of the PYD. The movement is affiliated with the Kurdish PKK, which has waged a long and bloody insurgency in southeastern Turkey. The statement seemed to echo comments made last week by Turkish President Recep Tayyip Erdogan in which he said the U.S.-led coalition fighting ISIS militants in Syria were bombing Arabs and Turkmens near Turkey's border. "On our border, in Tal Abyad, the West, which is conducting aerial bombings against Arabs and Turkmens, is unfortunately positioning terrorist members of the PYD and PKK in their place," Erdogan said. Khalil strongly refuted the claims, dismissing the groups as "people who use sectarian language." He sought to calm nerves, saying the YPG is a Syrian national group whose battles are directed solely against ISIS. "We say to residents of Tal Abyad, there is no reason for you to cross to another country (Turkey). Our towns are open to you, you are our people and you will return to your towns, villages and properties," he said. He added that the YPG will not interfere in administering Tal Abyad once it falls. Losing Tal Abyad, some 50 miles north of Raqqa city, ISIS' self-styled capital, would deprive the militant group of a direct route to bring in new foreign militants or supplies. The Kurdish advance, coming under the cover of intense U.S.-led coalition airstrikes in the area, would also link their two fronts and put even more pressure on Raqqa. ISIS, led by Sunni Arabs from Iraq and Syria, has massacred hundreds of Shiites and other opponents and boasted of the killings in online videos. The extremist group has also kidnapped hundreds of members of the Yazidi religious minority - who are ethnic Kurds - and enslaved women and girls.